Innov-E Foundation | Helping youth innovate for a better world! Innov-E Foundation envisions a world where everyone is working together to raise awareness and reduce domestic violence. Innov-E Foundation envisions a world where everyone is working together to raise awareness and reduce domestic violence. WELCOME to the Innov-E Foundation Web Home! The state of our future world depends on the creative positive strength of the youth of today. We strive to promote a level playing field of access to opportunities to economically challenged kids from the developing world and the youth who are challenged with disabilities. Our key programs utilizing film making for laying a creative communication bridge between kids in less developed nations with their counterparts in developed societies contribute to enhance creativity, global interaction and peaceful collaboration. With the many youth, who are developmentally challenged, we want to provide them with the same opportunity to enhance their creativity. Join us in making your direct impact in the Innov-E quest of changing the world through empowering youth in visual arts all around the globe. Check out our latest news in our Press Room page. Learn more about Innov-E Foundation, Inc. on our Blog page. Watch for upcoming announcements for our 2019 Golden Tangerine Innov-E Film Awards and a golf-training day for youth. Our Executive Director, C.L. 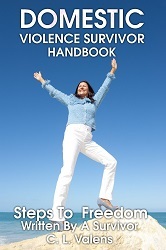 Valens, has published a “Domestic Violence Survivors Handbook” to help individuals learn the steps needed to leave abusive relationships. It is available on Amazon, Kobo, and Nook. She is donating a percentage of her handbook sales and public speaking engagements to Innov-E Foundation. Her dream and now one of her goals is to raise funds to build a safe house under the nonprofit umbrella. Innov-E Foundation envisions a world where everyone is working together to raise awareness and reduce domestic violence.